Fashion is many things to many people. It can appeal to the masses or be elitist. It can be momentary, cheap and immediately disposable, catching the wave of a trend. Or it can be highly expensive, handmade and a piece of art. In some hands, it can even be performance. Avant-garde is the hautest of haute couture – clothes intended to make a specific statement rather than to be worn on the street. 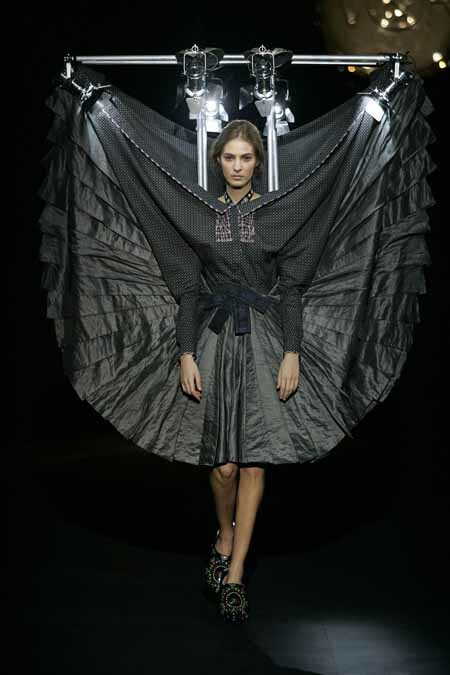 Some of its most exciting proponents are Viktor & Rolf (V&R), a design duo from Holland who have taken the fashion world by storm for the past 15 years. Their shows are as much about the performance and the artistry as they are about the fashion, and their vision is strikingly original and unflinching. Now, at the Barbican, their career is presented with a surreal charm and knockout creativity in ‘The House of Viktor & Rolf’. The heart of the two-storey installation is the ‘doll’s house’, made specially for the exhibition, which contains perfect miniature replicas of the signature V&R pieces on display on larger versions of the dolls. Ranged around it is a series individual ‘rooms’ each given over to individual collections. In each of these, selected garments are displayed with footage of the catwalk show in which they appeared. This gives the opportunity to see the exquisitely made garments up close, but also in the context of their collections, and means you never quite see the same thing twice however many times you visit each room. Whether or not you like the result, you won’t fail to be mesmerised by the wit and bold execution of the designs. And for every garment you admire, there’s one that you can’t believe was made. I particularly loved ‘Long Live the Immaterial (Bluescreen)’, in which blue garments have moving images imposed on them using blue-screen technology, making them appear to come alive; ‘Black Light’, in which the black-and-white clothes are first viewed under ultraviolet light, creating intriguing silhouettes, and then in ordinary light; ‘Black Hole’, in which all-black garments come down the runway on models with blacked-out faces and hands; and ‘Flowerbomb’, with its witty use of bows, the juxtaposition of the same pieces in black then exuberant pinks and the chutzpah of sending models down the runway wearing motorcycle helmets with the visors down. My favourite collection all round was ‘Bells’ – models emerge out of a fogged-up catwalk preceded by the sound of hundreds (sometimes thousands) of various sized bells – but I was highly entertained by ‘The Fashion Show’, in which every model ‘wore’ her own rig holding lighting and sound systems and the clothes were elongated onto the framework. And I’m certain that everyone will wish for one of the pieces from the ‘Bedtime story’ collection which is essentially a giant red duvet and oversized pillows – not too practical for the Tube, but producing sighs of appreciation. 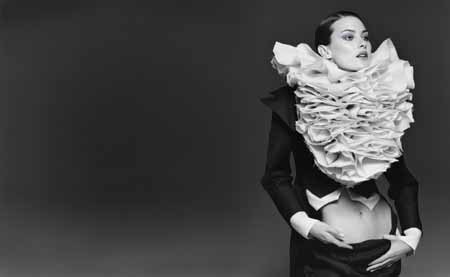 It doesn’t matter whether you’re into fashion, the exhibition can be seen as performance art on a grand scale. This is not a show that you’ll leave and forget – the designs will provoke impassioned discussion about whether the clothes are genius or madness (often both at the same time). You’ll never see anything like this again, I promise you. Oh, and buy some of the postcards or no-one will believe your descriptions!